An anonymous person in a forum has sent out the above image which contains details about BMW Motorrad’s upcoming dealership in Pune. This essentially means BMW Motorrad will be officially bringing its entire range of motorcycles in India starting April 14, 2017. The dealership launch will mark BMW Motorrad‘s official entry into motorcycle market in India. As per the information which we have, Bavaria Motors is going to be the first BMW Motorrad dealership which will make its debut in India. The exclusive Bavaria Motors BMW Motorrad dealership is located in city of Pune. 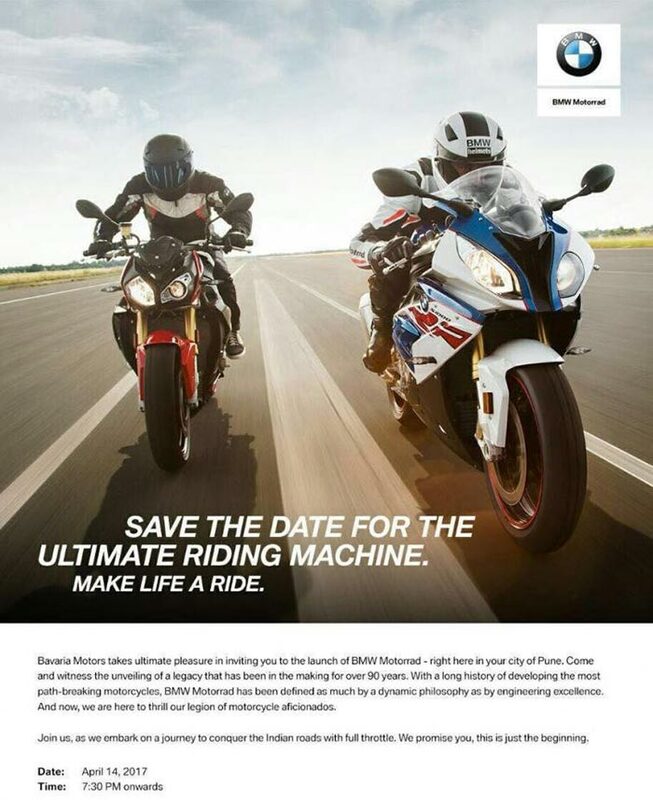 BMW has postponed the launch of BMW G 310 R motorcycle from quite a long time. The recent reports have confirmed that the entry level motorcycle from BMW (G310R) will make it here in India only by the year end. When the exclusive BMW Motorrad kick starts its operations, it will be selling only higher capacity motorcycles like S1000R, K1600, R1200, R NineT and S1000RR which are actually CBU units. You will still have to wait several months until BMW Motorrad launches G 310R officially in India. For now, First-ever BMW Motorrad dealership Bavaria Motors will be launched in Pune.